Empanadas are nearly, if not equally, as pervasive as beef in Argentina. While these little treats may come in the same general package- a half-moon shaped pastry dough, fried or baked- the fillings are diverse. The most common and popular empanada is stuffed with beef, but other common varieties are ham and cheese, capresse (cheese, tomato, and basil), chicken, and vegetable. Empanadas vary greatly from region to region. Generally, every province has a typical empanada; most of the differences lie not within the preparation, but the ingredients the pastry is stuffed with. For example, empanadas from Tucumán are baked or fried and stuffed only with meat (beef, chicken, or tripe) and the occasional scallion. They are particularly juicy because the meat is cut precisely with a knife and only fully cooked at the very end of preparation. 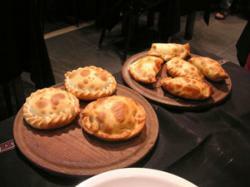 Empanadas from Salta are characterized as containing potatoes, chilies, and beef. In Córdoba, empanadas are sweet and contain raisins, sugar, and potato. Of course, not all empanadas are created alike. Many chain stores (Solo empanadas, Morita) make decent empanadas and are very convenient (they are more prevalent than McDonalds), but once you have had an empanada casera (home-made empanada), it is difficult to go back. If it is convenience you seek, many empanada stores also deliver. The one thing to love about all empanadas- whether they are mass produced or made by an 89-year-old woman and sold on the street every morning- is their very economical price. Some of the best empanadas can be purchased from mobile vendors at street fairs (one homemade beef empanada at the Recoleta fair particularly stands out in this author’s mind) but there are hundreds of excellent locations. Just a few suggestions are listed below. A rustic restaurant that has been in existence for over 30 years, El Sajuanino offers empanadas that are famous throughout the city. Yemeilén, located in Bariloche, near the border of Chile, offers empanadas with unusual flavor combinations; Patagonian lamb or cherry. This page rendered in 0.724 seconds.